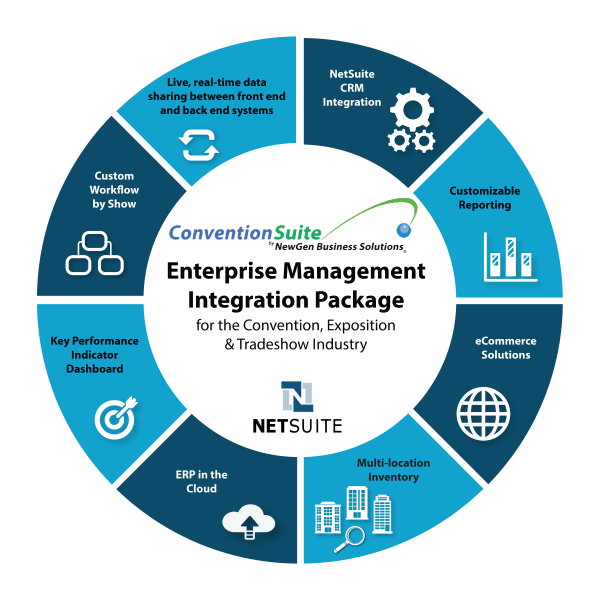 ConventionSuite takes advantage of NetSuite’s powerful ERP features and web-based design to provide your solution over any web browser. Configurable Dashboards display key information geared toward the person or group logged into ConventionSuite. There is one database for ConventionSuite, so changes made in the back end interface are immediately available to any users viewing the data on the website or customer center. ConventionSuite does NOT push data into NetSuite; it is all one database that shares data. Sales and expenses hit the P&L immediately upon approval; no need to post journals or import data. As soon as a customer places a web order, it is in front of a ConventionSuite user. The customer and employee can both see the same order at the same time. NetSuite has a full CRM system, including Lead and Opportunity tracking and mass email merges. All data in the CRM is available to ConventionSuite with no duplicate data entry required. Track Leads and Opportunities, as well as communications such as phone calls, tasks, and appointments. NetSuite has a full Marketing segment including Campaign tracking with email blasts and other activities, email subscriptions, and click-through tracking. Netsuite follows all SCC rules for email marketing. Reports and queries are accessible and easily updated to meet your business requirements. Full training is provided. ConventionSuite comes with a full array of Show reports, including Delivery Reports, Exhibitor and Booth Listing, Payment Summary reports, Sales by Show and Item Category, and AR Aging Report. NetSuite provides a variety of ERP Reports, including Financial Reports, Sales and Pipeline reports, Purchasing and Inventory reports, and Web Store Activity reports. ConventionSuite utilizes NetSuite’s built-in eCommerce features to provide a seamless web ordering experience for customers. Exhibitors have access to all Shows and Booths to which they are assigned. Order history is available across shows in the web customer center. You choose the item categories available for the Show. Not offering Booth Cleaning for this show? Leave that off and the item and category are not available to select. Credit Card processing is fully integrated and can be configured to the security level of your choice and is, of course, PCI compliant. Manage assets and inventory items in multiple warehouses or locations and run requirements reports to ensure the proper inventory levels. Asset items can be managed by date required. Not enough side chairs in Chicago for the big show weekend? Enter a Transfer order to ship some from Detroit. The shipping module can be integrated with FedEx or UPS to provide real-time rates and print tracking labels right from NetSuite.